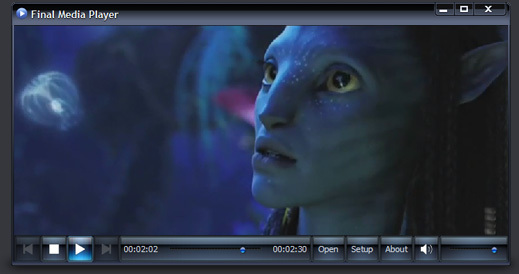 Free player for FLV, MP4, 3GP, VOB, WMV etc. files. Final Media Player is a free non-bloated, simple video and audio player and it will play almost any audio or video file you throw at it. Everything is included with the installer. Simply download and run Final Media Player and you will be able to play your video and audio files right away. Oh.. and it's true: Final Media Player is 100% free. For real. Qweas is providing links to Final Media Player 2011 as a courtesy, and makes no representations regarding Final Media Player or any other applications or any information related thereto. Any questions, complaints or claims regarding this application Final Media Player 2011 must be directed to the appropriate software vendor. You may click the publisher link of Final Media Player on the top of this page to get more details about the vendor.